A young American Indian woman’s existential questionings and daily life on an Oklahoma farm will appeal to fans of historical fiction and personal narrative. Early in the 20th century, the U.S. government assigned plots of land to the American Indians displaced by Oklahoma’s statehood. Maud Nail’s day-to-day life on her family’s allotment is consumed by guns, dirt and chickens. She cares for her men–a dangerous, unruly father, aptly named Mustard, and a sensitive, thin-skinned brother named Lovely–as well as the extended family whose allotments neighbor hers. They recently survived the flood of 1926-27 that covered Oklahoma and much of the Midwest, but the difficulties don’t stop there. 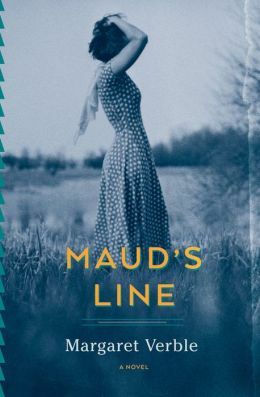 Margaret Verble’s first novel, Maud’s Line, details the year in which Maud makes several large choices that will affect the rest of her life. A peddler in a brilliantly blue covered wagon first captures Maud’s eye with his good looks and his books. He gives her a copy of The Great Gatsby, and she can’t stop thinking about those bobbed haircuts and dresses above the knee. Though she loves her family, Maud desperately wishes she could move on, live in a different world. But as she begins to be caught up in a nascent love affair, her family’s troubles demand her attention. Two men from the family that has long feuded with hers are murdered, and Mustard has to leave town in a hurry. Lovely falls ill, and then, more troubling still, seems to be losing his mind. And Maud’s occasional, erstwhile boyfriend then makes a claim on her, just as she is struggling with the biggest dilemma of all. Maud’s Line is filled with evocative glimpses of violence, viscera, yearning and the brusque but communal caring of family. In her unadorned writing style, below the violence and hardship on the surface of Maud’s life, Verble crafts a story filled with nuance and quiet conflict. She exhibits a talent for characterization: each individual is carefully and distinctly fashioned, so that Lovely’s girlfriend and the members of Maud’s extended family, for example, shine brightly in even the briefest of appearances. Maud herself is finely wrought, caught between the values she’s been raised with–and the people she loves–and a hope for a different life, one with electricity and hygiene in place of dust and blood. One of the greatest strengths of Verble’s novel, set on her own family’s land allotment, is the delicate interior conflicts produced by Maud’s deceptively simple life. Propelled by its own momentum, Maud’s Line pulls the reader along until, amid daily privations and small tragedies, Maud has the chance for the first time to choose for herself what her future will hold. This review originally ran in the June 30, 2015 issue of Shelf Awareness for the Book Trade. To subscribe, click here. I enjoyed this book. It was reviewed on my blog. from your review, it would appear that Maud’s Indian heritage & culture is treated as part of the narrative background, and not a significant part of her story; true? True. She is not recognizably, culturally “other,” except in feeling alienated from mainstream white culture. That didn’t feel unrealistic to me, though; it seemed plausible. It’s the author’s own background, and I have no personal experience to inform me, so may as well trust her.